It’s that time again! The time of year that Andy Williams (and an impressive array of pop singers since) deemed “most wonderful.” Time for baking cookies and homemade kugel. Time for strolling past elaborately decorated storefront windows, and time for those cheesy (yet nostalgically endearing) holiday-themed coffee and tomato soup commercials. The winter holidays can evoke a sense of magic and wonder, for sure. But for those of us who have long outgrown leaving out carrots for reindeer, the end of the year can also bring up a certain sense of urgency, anxiety, and worry. You know, the infamous “holiday stress.” While practicing yoga won’t make you immune to it, it can help. But even though the stress-reducing powers of yoga are well known nowadays, putting practice on the back burner (at least until New Year's resolution time comes ‘round) can seem awfully tempting once the days become shorter (for those of us in the Northern Hemisphere anyway) and more full (a seemingly cross-hemispheric phenomenon). 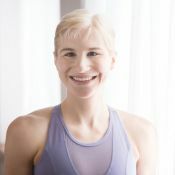 Not to mention that for many of us, money is especially tight this time of year, making budgeting for that month-long unlimited asana class pass a bit of a challenge. You know, the infamous “holiday stress.” While practicing yoga won’t make you immune to it, it can help. Still, when seasonal stressors make life particularly hectic, regular practice can be especially grounding and nurturing, and often provide much needed space and perspective in the midst of a festive frenzy. It can be tough to drag yourself to an evening class, or even bust out a few sun salutes at home when it’s dark by 5 p.m., and many an evening is packed with holiday-related errands and events. That’s why keeping a regular a.m. appointment with your yoga mat can be an especially good idea come December. Despite the fact that I really enjoy my daily asana practice, when I’m already feeling harried it starts to feel like one more “to-do” to squeeze into an already jam-packed schedule. Even though I’m slowly learning that it’s not the end of the world if I skip a day, I do find that regular asana sessions help me to feel happier, calmer, and more confident—and that whatever else I was stressed about doesn’t seem quite so insurmountable by the time I’m wiggling my fingers and toes and getting ready to roll out of shavasana. And when practice happens earlier in the day, I find it's far more likely to serve as a source of that energy and empowerment instead of being just another source of anxiety. While I don’t mean to reduce yoga to merely an item to check off my to-do list, I do find that sense of “Hooray! It’s only 8 a.m. and I already did something!” to be a nice little encouragement—especially when seasonal depression starts to kick in, or on days when I wake up feeling overwhelmed. Useful life-hack: sleep in clothing that you can practice in. Waking up in asana-ready attire makes for one less barrier between you and that first morning down dog. For me, morning practice sometimes means setting my alarm a couple hours earlier to squeeze in an a.m. yoga class (I’m not naturally an early riser but I’ve found that waking before dawn is a bit more manageable once daylight savings time has ended). But usually it means setting my alarm just a little earlier and rolling out of bed and onto my yoga mat. (Useful life-hack: sleep in clothing that you can practice in. Waking up in asana-ready attire makes for one less barrier between you and that first morning down dog). Consider a shorter practice (and know your go-tos). The whole thing takes me half an hour, tops (including shavasana). You can also think of your go-tos as individual exercises or asanas to support you throughout your day—a favorite shoulder stretch during a work break or a pre-party agni sara to help you digest those decadent holiday treats. Commit to incorporating some simple practices into the rhythm of your day and you’ll likely discover that you feel more supported and centered this season. Take advantage of smaller class sizes. If you do make it to class, you might notice that it’s not quite as crowded this time of year. Smaller class sizes mean more individual attention, and you may find that your teacher is able to offer you some personalized pointers that wouldn’t be feasible in a larger class. Another bonus? Tinier classes tend to make for a more tight-knit group. This provides excellent opportunities for getting to know your fellow practitioners a little better and for connecting with community during a time of year that can feel especially lonely for many. Treat yourself to a restorative class. Lots of studios put a few extra restorative classes or workshops on their schedules near the end of the year, and for good reason. Well known for its stress-reducing superpowers, restorative yoga can serve as an especially calming and centering force when the culture as a whole often feels, well, not so calm. Plus, restorative classes are often ideal when it comes to bringing a friend. If you're traveling or have guests visiting you, you might have better luck convincing non-yoga-practicing loved ones to lie luxuriously over a bolster amidst the glow of soft candlelight than you would convincing them to accompany you to a 90-minute hot class. Invest in a travel mat. My yoga mat has been my carry-on more times than I care to count, and while it's certainly nice to step onto a familiar favorite once I've reached my destination, lugging it around can be pretty annoying (not to mention the inevitable side-eye from fellow passengers, whom I imagine thinking, “Really? You’re going to stickthat in the coveted overhead compartment space?”) Solution? Travel mat! Travel-sized mats are extra thin (so maybe not ideal for those who like a little more cushion) and easily fit inside your suitcase or carry-on bag. The two I alternate between (and have been, for the most part, pretty pleased with) are the Lululemon travel mat (I like how this one feels extra “grippy”) and the Manduka eKO Superlite travel mat (very foldable—I’ve even managed to fit it inside my purse and still had room left over for my in-flight snacks, headphones, and the latest issue of Vanity Fair). Airport yoga is, like, a thing now. At least if the photos I scroll through on Instagram each day are any indication. While I admire other practitioners’ ability to take an impromptu tree pose in the TSA line, or hold a handstand on the moving sidewalk, I’m personally a little shy about the #PublicDisplayOfAsana. That’s why I was stoked to discover that some airports (including San Francisco International Airport, Dallas/Fort Worth, and Chicago O’Hare) now have “yoga rooms,” spaces specifically designated for practice. Other airports (including Raleigh-Durham International Airport, Albuquerque International Airport, and San Diego International Airport) provide on-site meditation rooms where you can slip away to for a little pre-flight solitude. Some airports now have “yoga rooms,” spaces specifically designated for practice. Travel provides a great opportunity for visiting new studios, practicing with different teachers, and exploring diverse styles of yoga. It’s also a great way to make long-distance yoga friends, too. And (bonus!) some studios are even cool with offering “new student specials” to travelers. But before you pop in for a drop-in, do make sure their studio is actually open. Some yoga centers close for a week or two during the winter holidays, so it’s a good idea to check the schedule online or give them a call first. What about you, readers? Any holiday (or travel) practice tips that you’d like to add or share?